Are the Digital Humanities and Library & Information Science the same thing? The following is a summary and further discussion around the presentation which I gave in May at ISI 2015, held at the University of Zadar, Croatia. The original paper, written with Ernesto Priego and David Bawden, was part of the stream on exploring the disciplinary boundaries of library & information science, and is published as: Robinson L, Priego E and Bawden D (2015). 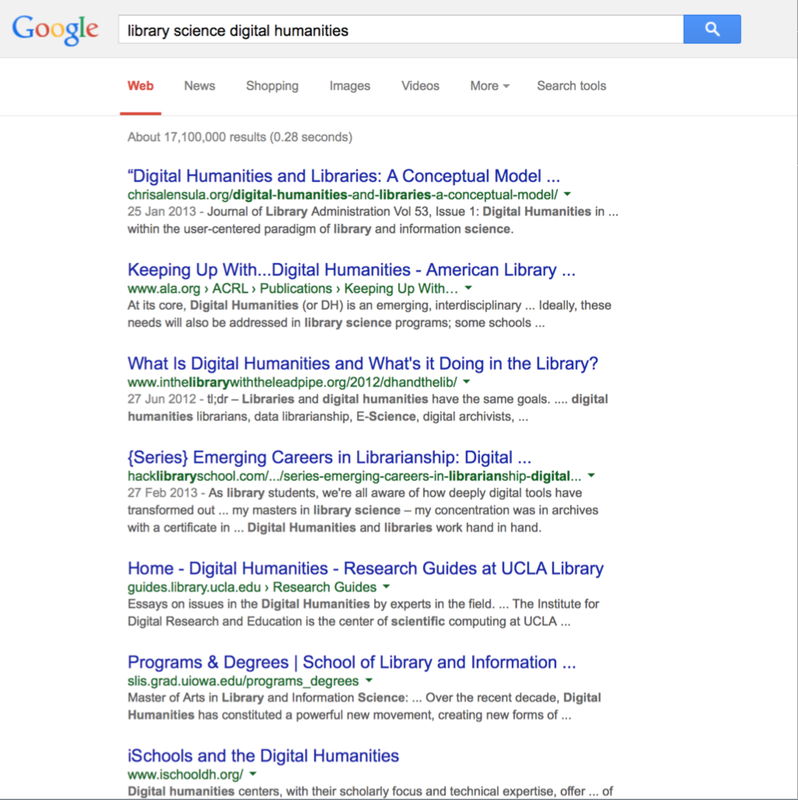 Library and information science and digital humanities: two disciplines, joint future? In: Pehar F, Schlögl C and Wolff C (eds.) Re-inventing information science in the networked society. Glückstadt: Verlag Werner Hülsbusch, 2015, pp 44-54. There is much talk of the relationship between digital humanities (DH) and library & information Science (LIS) these days. We know this, because a quick and dirty Google search throws up some links to serious thoughts on how the two disciplines are interrelated. A more detailed search of the current literature further reveals an increasing number of papers within the LIS domain which discuss how the concerns of DH are linked to the traditional concerns of the LIS discipline, and to the core competencies of librarianship. This, added to the increasing focus on digital collections of major LIS players such as the British Library and the Wellcome Library, suggest it is timely for those of us involved with teaching and practice to examine the close relationship our discipline has with DH. Further encouragement can be gained from noticing the prominence in London of DH centres and courses, the transition to digital scholarship, and the critical mass of social media datasets available for analytics and visualisations. LIS has always been described as a broad discipline (see Bawden and Robinson 2012). This has often been seen in a negative light, as its components are readily appropriated by related subject fields, such as computer science, linguistics, psychology, human computer interaction, management and publishing. 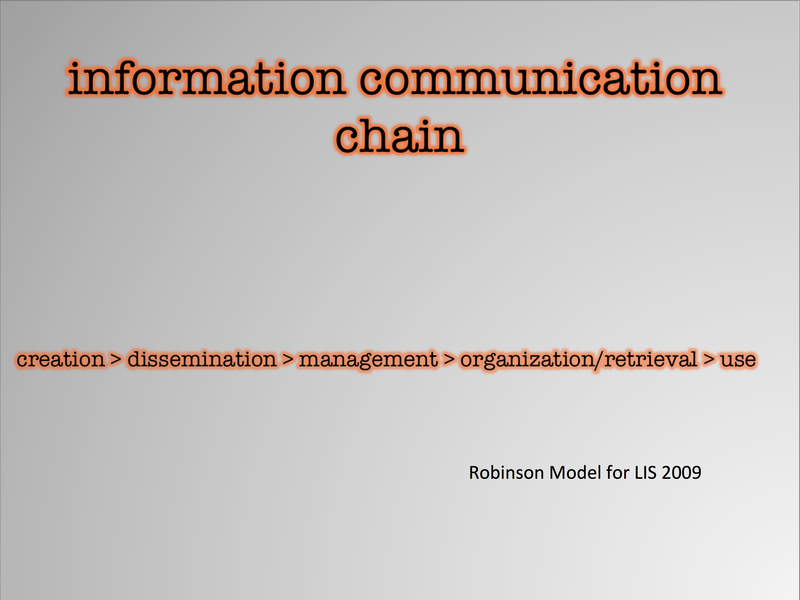 However, if we focus on the fact that LIS is centred on the topic of information, instantiated as documents, we can see that LIS is about all the processes of the information communication chain (Robinson 2009). No other discipline is interested in documentation in this way. Further, it is noteworthy to consider how many members of related disciplines are, in reality, thinking and practicing LIS. How is DH linked to LIS as a discipline? How should evolving DH content be integrated into LIS masters courses? In order to answer these questions, an analysis of a selection of the literature was carried out. Relevant articles were identified by searching for LIS and DH terms in the title, abstract and descriptor fields of Web of Science, LISA, LISTA and Google Scholar. As papers of this nature are relatively recent, no time limits were applied. The articles were then carefully read to elicit themes, models and suggestions for LIS curriculae. References at the end of each paper were scanned for further insight. The following six themes emerged from twenty two relevant papers. It is not suggested that these themes are definitive, they are however, indicative of the ways in which DH and LIS are related. Sula (2013) showed a steady increase in DH related publications in the LIS sources in the LISTA database between 2005 and 2012. LIS and DH have embedded pedagogical practice; LIS instantiated as information literacy and DH as champions of education for the use/development of related methods, tools and technologies (DH literacy). One model showing the relationships between LIS and DH was found, Sula’s conceptual model (2013), based on a cultural informatics framework. This model shows the ways in which LIS and DH interlink across the dual spectrums of first-order to second-order content, and human to computer driven tasks. From this picture, we can see a close relationship between the activities comprising the two disciplines. However, the information communication model (Robinson, 2009), offered as a basis for LIS, could also represent the concerns of DH at a more fundamental level. A look at the content of LIS and DH courses in the UK/US reveals crossover of content such as web content design and development, resource creation, organization, preservation, publishing and dissemination, metadata, data analytics and visualization, literacy and pedagogy, digital culture and policy. Again, we can see a close connection between the disciplines. The original paper concluded with support for the well documented similarity between the two disciplines, and in anticipation of closer convergence in the near future, especially with regard to the content development for masters courses in LIS. 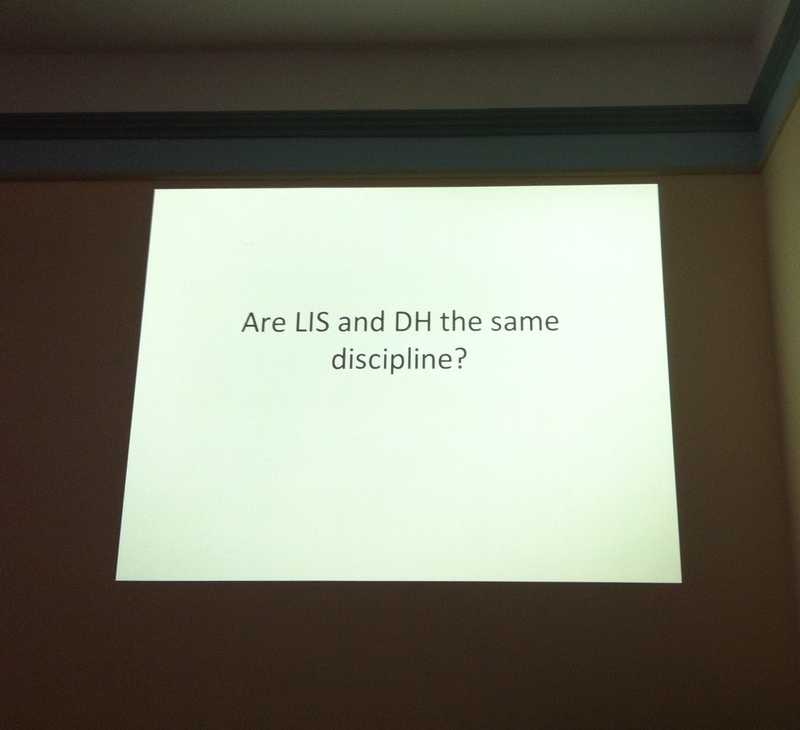 However, on putting together the slides for the verbal presentation, a stronger question emerged, asking whether DH and LIS could, in fact, be the same thing. This suggestion, understandably, provoked some further discussion amongst the delegates, and it seems worthwhile to record some aspects of the debate here. This is not a question that can be answered definitively in a single presentation, nor in a follow-up blog posting. But, on reflection, it is probable that the answer to the question is ‘sometimes’, depending upon the context. Let us consider first, that LIS can be understood as a meta-discipline, one which can be applied to any subject or field (reflexively including itself). It is about the communication chain of information (instantiated as documents) within that field. LIS supports and underpins all disciplines in the act of collecting, indexing, disseminating, storing, preserving and sharing of knowledge, for the ultimate purpose of promoting understanding. It is arguable that without LIS, there would be no understanding, nor hence progress, in any discipline beyond that which can be carried within the mind of an individual. A medical subject expert, physicist, mathematician or engineer, can subsequently take an interest in the communication aspects of their discipline, either with a desire to work as an information professional, or increasingly to function more adequately as a subject specialist. Likewise, experts and practitioners from the arts and humanities disciplines can also acquire the additional skills and understanding of the communication of documents within their field. This traditional understanding of roles allows us to separate subject specialist expertise from the activities associated with the practice of LIS. Although the two are certainly complementary, an engineer is not necessarily an engineering information specialist, and a specialist in engineering information is not necessarily an engineer. The same argument goes for other subjects, including the humanities. (See Hjorland 2002). This traditional, and often reassuring, distinction between subject specialism and LIS is now however, rather more blurry. The definition of a document has evolved over the past 50 years to include digital media files, but perhaps it has changed most significantly over the last 10 years, with the advent of Web 2.0, where the separation of form from digital content spearheaded the creation of a myriad new resources. Additionally, the emergence of e-science resulted in new documents in the form of digital datasets, and most recently we are working with the move towards digital scholarship, recording not just data/metadata, but also process and methods, across all disciplines, not just in STEM subjects. Accompanying this change has been a shift in the scope of LIS, to accommodate not only the handling of a more diverse spectrum of documents, but also to embrace an increasing emphasis on analysis, interpretation and explanation of document contents. Increasingly, LIS practitioners offer support to researchers in curation, understanding and interpretation of research data sets, often across disciplines. This may be seen as an extension of their longstanding role as champions of information literacy, potentially with echoes of support for evidence based medicine, and embedded librarianship. On the flip side, researchers too, are becoming more aware of the importance of LIS skills and techniques to record and facilitate their work, so that the boundary between subject specialist and LIS expert becomes less distinct. Consider bioinformatics, chemoinformatics and social informatics. Indeed, LIS practitioners are themselves increasingly the creators of new documents, for example, in digitizing and disseminating local holdings. Driven by the digital, there is a need for all of us to be information literate in the 21st century. Before moving to the relationship of LIS to the digital humanities, it is important to highlight that there is a difference between the practice of LIS, (librarianship, archival work, records management, information management) and the academic discipline of LIS, which has not been explicitly referred to thus far. In as much as discipline and practice are most helpfully regarded as symbiotic, this should not matter, but when we examine the aims, theories and research methods in order to look at how LIS compares and contrasts with DH, it is prudent to acknowledge the distinction. The difference between academic research and professional practice seems harder to draw out in DH than in LIS, but this may be a subjective view, writing from a personal background in LIS, rather than DH. It is perhaps in what is considered practice, that there is most similarity between the two disciplines. Aspects such as the creation, curation, indexing, dissemination, and preservation, of documents, understood in the broadest sense, are common to both LIS and DH practice. Likewise the involvement of practitioners from both disciplines in teaching and learning, promoting the skills and understanding of tools to find, augment, analyze and share resources. The point of department comes when we consider each discipline as an academic subject. Whereas the focus of LIS research is to examine the processes comprising the information communication chain in its entirety, the focus of digital humanities research is to further research in the humanities. What is Library and Information Science? Library and information science (LIS) is a long-standing academic discipline, with its own set of theories and perspectives. It focuses on the study of the communication chain of recorded information, and supports the practice of librarianship, information management, archiving and records management and other collection professions. The theories, methods and tools of the digital humanities, which are still evolving, are doubtless readily claimed by members of both the DH and LIS communites to differ from those of LIS. However, whilst LIS is considered by many to be a social science, it has clear connections to the humanities, deriving from its origins in bibliography and documentation. This is not the only connection; the topic of book history is often found within LIS departments and syllabi. Book history can be studied from two main angles, both based in the humanities; the UK/US approach rooted within English Literature, and the Franco/European approach, growing from historical analysis and socio-cultural theory. LIS is a broad discipline, and it can accommodate and enjoy an equally broad scope in methods and tools. It may thus be appropriate to acknowledge that contemporary times bring complications to the easy conclusion that LIS and DH differ from the starting point of theories, methods and tools. It seems likely that both disciplines investigate, and can themselves be investigated, by methods from both sides. It may be valid, for example, to study aspects of LIS (e.g. texts, Twitter datasets), using the methods and tools more usually associated with DH. A next stage endeavor to this conversation, would be to identify, compare and contrast the theories and methods of LIS with those of DH, and the humanities in general. With the convergence of GLAM (galleries, libraries, archives and museums) sector activities, driven by born digital documents and digitization programmes, the disciplinary and sector boundaries of just ten years ago are being erased, and although this is most evident in practice, it is clear that our academic silos are fading, and we find ourselves within an era of interdisciplinarity, where digital data doesn’t care whether the theories and tools belong to LIS, DH or any other discipline. LIS and DH may not be identical twins, but they are often seen wearing the same outfits. Bawden D and Robinson L (2012) Introduction to Information Science. Facet Publishing: London. Hjorland B (2002). Domain Analysis in Information Science. Eleven approaches – traditional as well as innovative. Journal of Documentation, 58(4), pp 422-462. Robinson L, Priego E and Bawden D (2015). 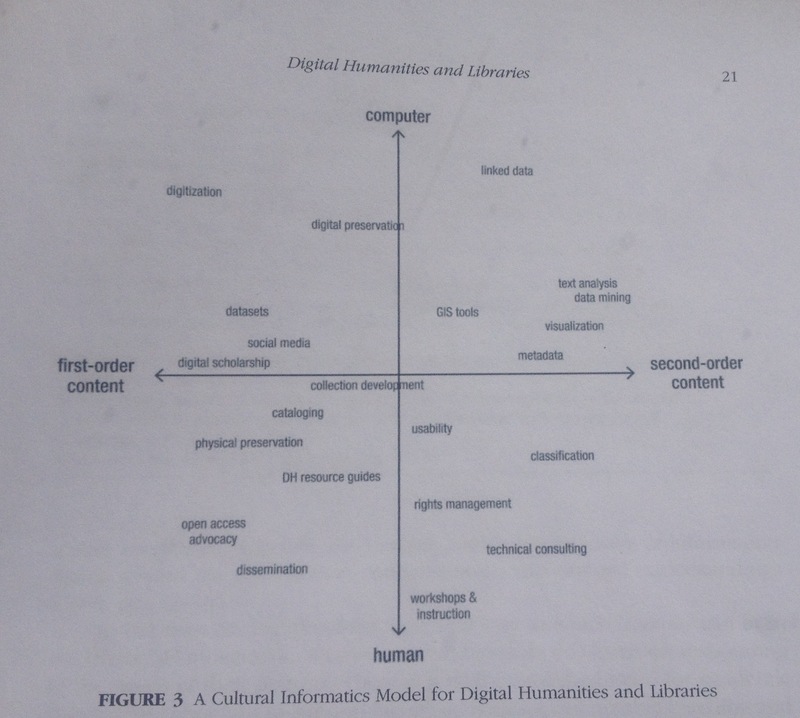 Library and information science and digital humanities: two disciplines, joint future? In: Pehar F, Schlögl C and Wolff C (eds.) Re-inventing information science in the networked society. Glückstadt: Verlag Werner Hülsbusch, 2015, pp 44-54. Robinson L (2009). Information Science: the information chain and domain analysis. Journal of Documentation, 65(4), pp 578-591. Sula C A (2013). Digital Humanities and Libraries: A Conceptual Model. Journal of Library Administration, 53, pp 10-26. This entry was posted in Research and tagged digital-humanities, disciplines, LIS by Dr Lyn Robinson. Bookmark the permalink.